Slightly puzzled, and happy to be corrected here. "It is not hard to overload a mains socket - simply plug in too many high power devices to an extension lead like a hair dryer or heater - but it not so easy to put out the fire - fire kills"
If you plug too many things in to an extension lead the fuse blows. Not a fire. The fuse blows. That is all. That is why we have fuses. Or are we saying a 13A socket cannot handle 13A? What am I missing here? And why is it worth someone (who was not named in advert) paying to run the advert on the radio rather a lot? I really hope it it not my tax paying for this? I also wonder what the public should do as a result of this advert? Do we add up current of all appliances, and if less that 13A it is OK? What is the load allowed on a 13A socket? If we have more than 13A and the fuse did not blow, who do we sue? You're right, but people are stupid - if a fuse keeps blowing I wouldn't put it past someone to pop a bit of aluminium foil in the plug instead. Also, the extension cables that coil up - I expect there's a number of incidents where one of them is unwound just enough to reach, leaving several metres in a neat coil on the reel. It's fine if you want to plug in a phone charger, but I wouldn't recommend boiling a kettle from one! Perhaps it's a comment about the scary number of people who don't properly fuse their appliances for the correct (anticipated) current draw. Or indeed, perhaps there are lots of dodgy 'extension leads' with 13A fuses but with conductors not capable of safely handling 13A. Certainly most modern properties have a 20A breaker on each ring main, and according to BS7671 there are strict guidelines about the thickness of conductors required in structured (electrical) cabling. Perhaps there are jerry builders who've been ignoring those regs? Well, if you use an extension lead/adaptor, it'll have a fuse in the plug for, and possibly another fuse in the block itself (if it's a decent one). So if you plug a couple of 3 bar electric fires into that, at least one of those fuses will blow, as it will be pulling around 26 amps. Therefore, no fire. You could overload a 13 amp socket by plugging in a couple of 3 bar electric fires into an unfused 3 way adapter, but even then, if you plug in a 3rd, it's likely that the ring main circuit breaker will trip as you will be pulling 39 amps. (30 amp breakers are standard for domestic ring mains). I think the fire risk is being totally overstated unless you're in a really old house without ring mains and with wire fuses in the consumer unit, which need a burst current of twice the rating to blow the fuse, so a 30 amp wire fuse will need around 60 amps to blow. In that case, yeah, you could start a fire. 3 way adaptors are required to be fused. Only 2 way ones don't require a fuse. Well that's crap. The standards should insist that a double socket can withstand 13A from both sockets. Look at some of the horror plugs at http://www.bs1363.org.uk/ that are available on eBay or Amazon, with their fake BS1363 certifications. I suspect these are a cause of electrical fires, but any properly certified equipment should blow the fuse as you state. BS1363:1995 requires that a double socket can sustain 14 amps through one side and 6 amps through the other for 8 hours without a temperature rise exceeding 52 degrees C. So the advert was technically correct. If you put two 13 amp appliances on the same double socket and go to bed you may wake up to the smell of smoke. You will probably wake up to find the socket and plugs are very hot and maybe the PVC insulation is breaking down. If you keep doing it then you'll certainly see scorch marks on most double sockets. So far we've had 20A and 30 quoted for a ring main. Any more incorrect guesses? (Maybe the advert does have a point). The correct rating for an MCB (miniature circuit breaker) on a 2.5mm squared twin and earth ring main is 32A. Even that's not the end of the story, because then there's trip curves to consider. Type B is normal for domestic properties. Type C is heavy domestic or light commercial to cope with high startup currents and inductive loads. Type D is industrial, very high startup currents eg. large arc welders. 30A used to be correct for a wire fuse on a 7029 imperial cable twin and earth ring main, but none of those have been installed in new houses for more than 30 years. Adding 2.5mm twin and earth cable to such ring mains is not valid, 2.5mm is not heavy enough to cope with how long it takes a 30A wire fuse to blow. But that's what all builders do when they make changes in old houses, but instead of using 2.5mm they should be using 4mm if they want to keep the 30A wire fuse rating. The better thing to do is change the consumer unit and install MCBs, then you can use 2.5mm. 7029 means 7 conductors of 0.029 inch something or other (I forget if it's radius or diameter, I'd look it up if I needed to). The earth on 7029 has 3 conductors. Horrible stuff to work with, far more likely to break a conductor than modern cable. Oh, don't forget a 13A fuse in a plug, being a wire fuse, probably needs more than 20A through it to blow. We really ought to replace them with some sort of ultra miniature circuit breaker, but it's unlikely to happen. Doesn't specify how, though - I expect many of them were worn out or badly connected wires rather than too many extensions. A reasonable guess is faulty or damaged insulation. There are many causes of that, including vermin and simple age. Of course, that's exactly what fuses and MCBs are supposed to protect against, but an intermittent arc could be surprisingly common. There is another factor - extension leads are sometimes made with 5A rated cable. (I have a couple of those that I assembled myself.) The trick, of course, is that you then have to put a 5A fuse in the lead's own plug to be safe. But even then, the advert conflates things, drawing attention to the wrong aspect of electrical safety. 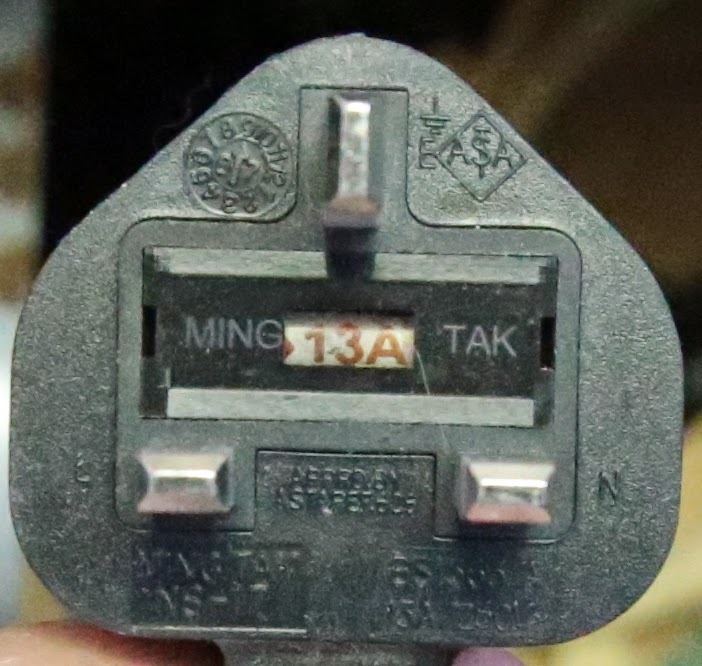 I wonder if it's a message copied from other countries, which don't have fuses in the plugs? I think the point is that there are many "bad" states you could have that can increase and cause fire. I think it's wholly sensible to be safe rather than sorry when it comes to this type of thing. We're actually very lucky here to have high standards and multiple safety mechanisms in the place. 7/029 is sseven strands of 0.29" 929 thou) diameter, and I remember my father teaching me about it. The thing about fuses is that they are a thermal device, so there's no way they can be fine at 13A and blow instantly at 13.0001A - they have a curve which describes how quickly they will blow (with tolerances) at a given overload, and it has points which are defined, such as at 2x rated current it must blow within 30 seconds, at 10x within 1 second, etc. (These aren't real figures!) So it is possible to have an overload that can continue for some time before thefuse blows, and that allows the cabling to heat up until it does. The whole system is designed (or should be if the sparky does his job right) so it is capable of handling what the fuse passes, and the fuse blows (or MCB trips) before any damage is done. But people abuse it, or course, and there are marginal conditions where heating can be a problem - cheap twin sockets are an example, because they aren't (required to be) designed to take 2 x 13A continuously, which surprises a lot of people. If you know you need to do this (two kettles at once, for example) install two single sockets instead, or use two physically separate sockets if things are already installed. But to go back to RevK's original point, it shouldn't be possible to overload a multi-way strip as long as it has the right fuse for the size of cable (I always label ones I make myself if they are less than 13A-capable). The way to defeat the system and overload things is to use a lot of cascaded 2-way adaptors, as they aren't required to be fused, wheras 3-way ones are (weirdly!). It's high time 2 way adaptops are required to be fused. It is the most obvious defeat of the system by non malicious people. Fuses are rated at the current that they *will not* fuse. A common example for a 13A fuse is 25 Amps for __half an hour__ before fusing. This is the fire risk window for the flexible cables in use to the appliances. This sort of overload is is known as a "slight overload", one of the most inherently dangerous faults we face in UK electrical practice. the same fuse, at an overload of 24Amperes, *should not* fuse in *less than* 10 second... to meet the standard. ...so, as long as the cable does not catch fire in 10 seconds at 53 Amps, you're fine. Try it in a test jig and let me know how you get on with your 13A flex. Then try it with 5A flex. Also note that a 32A ring main circuit would have a 32A overcurrent circuit breaker. Radial circuits (only normally seen in recent new-build housing in the UK) would have a 20A overcurrent circuit breaker. Circuits breakers are similarly slow at detecting slight overloads and can be just as dangerous as fuses. They are undeniably more convenient for the user though. Legacy compatibility demands that manufacturers and user do not cause injury or death even in older buildings even due to misuse and misconceptions about fuse performance. Builders are putting radial circuits in new build houses? That's utterly moronic, why do such a thing? Ring mains are much, much better. One thing that I've always found a bit concerning about ring mains is that if one side of the ring breaks, you're never going to know about it... Yet in that instance it's basically turned into a radial (which should be protected by a 20A breaker) with a 32A breaker! That has always concerned me too. I know sparkies doe tests when they put sockets in, and so on, but can they test that? What breaker any circuit should be protected by depends on the cable and electrical fittings. If you put 6mm squared on it can take more than 20A. Consider your cooker feed, that's usually a radial circuit on 6mm on a 32A breaker. 2.5mm cable on the other hand is not usually rated to 20A, and a known broken ring main should probably use a 16A breaker. The ohmic heating nature of the problem means cables have different ratings depending on how it is installed. Buried in plaster in a wall or in a big bundle under the floor like the stupid sparkies usually do are the worst, so is the usually quoted breaker. In free air with no other cables or clipped to the surface of brickwork a cable can be rated higher, and there are tables in the regulations that give you all this information. I have a radial circuit in my house, it was too difficult to extend the single ring main into a new wall and I felt the ring had enough on it already. I used 4mm twin and earth on a 20A Type B breaker. It's a shame 4mm is so uncommon and hence a bit expensive, it's good cable and I like it. My issue really is that rings and radials have different specified breakers for the same type of cable, and that whilst you /can/ test whether one side of the ring has come adrift, in practice testing isn't done regularly and it is going to go unnoticed for years. A 2.5mm² radial is probably going to have a 20A breaker on it, and if it breaks then you'll notice there's no power and you'll fix it. A 2.5mm² ring is probably going to have a 32A breaker on it, and if it breaks then everything is going to carry on working just fine, except that it's now behaving like a radial with a dangerously specified breaker. And it'll probably stay like that until the next time you get a sparky in (in 20 years time probably), or until your house burns down. I like it when broken things actually break noticeably so you know to fix them, rather than lurking dangerously, just waiting to give you a really bad day. I'm sure it would be better to have 2x16A breakers (one on each end of the ring) bonded together so if one trips they both go... That way, if the ring breaks and one side gets overloaded it'll safely trip out the whole thing. I am not convinced that 20A breaker on a 2.5mm radial circuit is valid. All my paper sources give 16A as the rating for 2.5mm twin and earth (installed in plaster or behind plasterboard on a dry lined wall or in a bundle of other cables). Ok, but either way, my point still stands: a ring where one end has come adrift is going to be running as a radial with a dangerously overrated breaker. This sounds really bad to me. Also, on the breakers debate, are there not different types of breaker - with different "trigger" options (think they're known as "types") - as when we moved office, we had to have some breakers replaced as the "cold start" current required was causing issues, so a different breaker was fitted that permits short term rapid draw or something (I can't remember what was discussed, I left that to the actually electrically competent). I mentioned this earlier, there are Types B, C and D. See above.